THEY ALWAYS recognize him. He looks just like his father, they say. And they always want to know what he is doing now, how he is, and will he ever marry. And even before the queries are phrased, they want to know as well why he is not in politics. The diplomatic cocktail circuit, in whose guest list he is a must, is familiar with the spare, dark suited figure. And occasionally, even strollers in the Luneta are startled by the hauntingly familiar face of the man with a camera, shooting away at the fairy tale scene of the sunset and ship lights on the bay. Or perhaps he wants to think. 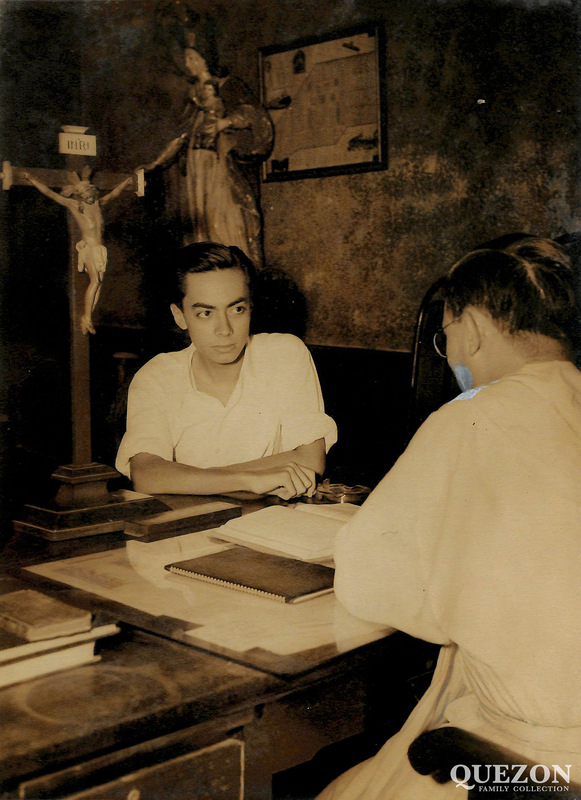 But with the face and the name Manuel L. Quezon, who can escape notice? Certainly not the late President’s son whom, acquainted or not, has learned to call Nonong. The same dark and bushy eyebrows, the same part of hair, the same probing eyes, the same finely proud nose, the same finely proud nose, the same lower lip with a pout– people say his father lives again in his face and wreathe him a legend. They would have him fiery again in the halls of Senate, grandiose again in Malacanang, heroic again in Malinta, sorely missed in distant illness and exile. The apartment is dim in the twilight. He seems to blend with its dusk, a shirt of dark blue madras and even darker pants, but his way is sure and certain as he leads the way to a grouping of Danish chairs upholstered in apricot and a giant L-shaped settee, round a table of dark wood. “I won’t bother to put on shoes, if you don’t mind.” he says and then reveals that he is shuffling about in leather slippers, but who really noticed? He slips on the other end of the settee, darting a watchful eye as the houseboy whisks off the afternoon’s dust from the table and then waving him off to buy some Coke. The water problem still bothers him and it reminds of the fire tat razed the area more than a year ago, leveling with deathly certainty the flower shops and the boutiques, the pseudo-art galleries, and the Maranao craft boards, all along Isaac Peral and down A. Flores. “The fire is under control, Nini.” he assured her, watching as the firemen trained their hoses on the blaze and wincing as the hoses flared up only to collapse when the water pressure surged and was gone. Fire and smoke billowed again and his sister agitated: “What do you mean it’s under control? I’m watching on television –and it looks wild!” His sister was distant and safe in her Gilmore home in Quezon City but she wanted to dash down and cart his things to safety. He stayed where he was in the reflected heat of fire around his veranda. Watching and waiting till the firemen dipped their hoses into the bay and so quenched the flames. But his apartment is pleasant and hushed with the quiet of bachelor life. Footsteps are silenced on a gray-green rug and more often than not, even the stereo set is mute. Tan curtains riffle in the breeze, white shaded lamps wait till dark is full and then are turned on singly, never in the blaze of light. There is a Dresden china doll atop a side table, a Maranao brass vase on a wicker pad on the coffee table. Twin plants, towering but lean, lend greenery where no flowers are and an oil of dancers –Are they doing the Tinikling? Is it a Japanese dance? –splashes color on the wall. The only other furniture in the living room is a dark wool commode, atop which are three pictures one is of his father, commanding, dignified, the President’s official portrait. It bears word to “my wife, the dearest, sweetest, most wonderful wife, with my everlasting, ever increasing love. Your loving husband, Manuel. Monrovia. Jan. 1, 1930.” The other is of his mother, gentle, smiling, also her official portrait. But side by side with it is still another picture, again of Dona Aurora, but at age 18 or perhaps 20. It is a rare photograph: a pristinely beautiful young girl, eyes large, soft, and dark, hair curling about her forehead, mouth tender and vulnerable. For all the soul caught therein, it might have been a portrait done by a painter enamoured of the model. Bert Avanceña comes in, quiet too in voice and smile. “This is my brother-in-law,” Nonong introduces. There’s a ripple of guilty laughter, guiltier still because Nonong’s cigarettes are “blue seal,” too. Nonong reddens at remembering and in the aftermath of laughter, the talk turns to smuggling. Bert Avanceña remembers a sojourn in Bacolod where he was plied with blue seals and someone remarked how in Quezon province, the unloading is openly done on beaches. Nini, after all, not only joined the Party for Philippine Progress (PPP) but also accepted the position of national recruitment chairman. For a person avowedly nonpolitical and who had assiduously kept in the background all these years, the move was entirely a surprise from which many had not entirely recovered when she forthwith sat at the presidential table of the PPP P100-a-plate dinner, was photographed for the papers on television, and if that wasn’t enough, embarked on this campaign tour that her family still hasn’t stopped talking about. But it wasn’t to be so. Fortnight ago, the papers came out with pictures of him at dinner with President Macapagal. The only other guest was LP senatorial candidate, Alejandro Roces. Ostensibly, the occasion served as a discussion of celebration plans for the late President Quezon’s birthday on the 19th. But some people saw otherwise and not a few thought that it was Nonong Quezon’s way, subtle and discreet, of saying who he is for. He isn’t for the PPP then? No. Certainly he isn’t for the NP? (President Quezon was in the NP, but not today, his heirs have filed a criminal libel suit against NP presidential candidate Ferdinand Marcos for insults against the late President as written in the Marcos biography, For every Tear a Victory…) Certainly not. Then he is an LP! No and then no again. There are yet some more serious aspects to the current party scene, as Nonong analyzes it. The LP, he thinks, has not kept all its campaign promises but campaign promises should be taken at a discount anyway. It is a calculated risk every time, Nonong thinks, that a man votes for a President in a democracy. “You can’t find a man who will solve all the country’s problems. The best you can have is someone who will at least try to govern well,” he says. For the apolitical Nonong, for the man who is totally nonpartisan, joining the Liberal party is out of the question, campaigning for President Macapagal rather remote, although he makes no secret of his support. And thus far it seems that if Nonong Quezon is going into politics at all, it will only be for one man: Anding Roces. Gifted with keenness for public affairs and honed with studies from the Scriptures to St. Thomas Aquinas and even Walter Lippman, he is cognizant of issues and controversies. Despite what he calls himself –“a hermit in a hole”– he is acutely attune to the problems of the times. And if there is anything certain about him, it is that he is not isolationist. “If a citizen isn’t interested in what is going on in his country, of what good is he?” he says. This citizen Quezon thinks nothing of disrupting a leisure Baguio vacation to protest the passage of the bill authorizing troops to Vietnam. His first impulse, he said was to pay for space in the papers. But with the draft of protest growing longer and longer, he discovered it not only impossible but financially unwise to wire or phone it to Manila where he wanted it published posthaste before the scheduled Senate voting. But there is one thing he wouldn’t do: run for public office. In 1959, then Vice President Macapagal sought him out to offer him the candidacy for governor of Quezon Province under the Liberal Party. Since it meant joining the Liberal Party –or just a party for that matter– Nonong declined. “Then again in 1961,” he remembers, “I hitched a ride with Vice President Macapagal from a party. In the car, he asked me if I would like to run for the Senate. I merely laughed and didn’t say a word. Someone else in the car said, ‘Nonong is just smiling; he isn’t saying anything — I think he means ‘yes’.” What Nonong really meant was No and stayed so even when, for the third time, President Macapagal, already elected as chief executive, offered him a plum: an ambassadorship. Yet he is paradoxically often pushed by a burning interest in people to seek out companionship. “I like people,” he says and doesn’t limit himself to social horizons of cocktail parties. But his interest in youth has bolstered his enthusiasm for this group, and indeed, when talk is of young people, he is set afire: “The greatest catastrophe of this country is when leaders do not realize that 76 per cent of our population are young, all below 30, with potential resources up here,”he taps a finger on his forehead. “They call him mercurial, they talk of his Spanish temperament, they make much of his Castillian ways –but how many people know that for every outburst, he apologized readily? They say he was very Spanish, very Castillian and unfortunately, he did look Caucasian. He had the pinkish-white skin of a Caucasian, even if his hair and his eyes were dark. ” But my father was very Filipino –I cannot imagine a man more Filipino. Sure, he spoke in Spanish a great deal of the time. He was better in Spanish than English or in Tagalog. But look at us, we speak in English –but does that make us any less Filipino? “And they speak of his Spanish habits and tastes –what were they? Even now I have to suffer through some of his Filipino tastes. When I am invited elsewhere, people inevitably serve me sinigang na isda: ‘This was your father’s favorite dish,’ they say. Unfortunately, I don’t like sinigang na isda but I have to sip it anyway! “How many people know that Dad was a very devout man?” and here Nonong chuckles. “I remember once on a Good Friday and we were praying the Seven Last Words. It meant reading one of the words from the Cross, followed by meditation and then a short prayer. Well, it became 14 words because the leader repeated ‘I thirst’ seven times and we, the children, started to titter. Instantly, my father was at us, shushing away, his eyes flashing. “And people also say that my father retracted from Masonry because of my mother. It wasn’t so. He retracted because he had lost his belief in Catholicism –and this all began when, after reading a book as a young man, he began to have doubts about hell. “Well after he renounced masonry, he wanted to study various religions in order to join one. He wanted to call for Gregorio Aglipay and all the other leaders to talk to them. But then one day, he just gave up and said,’Why should I talk to them. I probably know more than they do’ and so he called my mother, saying,’Pero Aurora, que stupido yo. Soy Catolico!’ And that was it: my mother didn’t push or nag him into it. “It was always that way with my parents: they had mutual respect for each other. Oh, they disagreed –but never, never in front of their children. With us too, it had always been that way. Look at Nini and me –she’s with the PPP and I don’t agree with the PPP, but we still get along. Other than this biography and his civic interest, Nonong lives to the hilt the luxury of his privacy. He’s a Baguio-hopper, dashing up one day to photograph the mountain falls, another to escape Manila’s schedules. He calls himself a “camera fiend” and has all sorts of gimmicks for his favorite hobby. Recently, he acquired a powerful cabin cruiser “I want to take it as far as Marinduque and Mindoro” and, much delighted with it, often calls up friends for impromptu cruises on the bay. Is the door forever shut up to politics? It is only this, the privacy he wants and the scholarly preoccupation with the affairs of men and the events they shape? Out of his memories, Nonong often tells a disarming story.